In this instance our customer needed to tip small drums into a vessel, the dimensions of which meant they required at least 700mm of reach ahead of the front wheels. In confined spaces it can be difficult to follow correct manual handling practices without custom equipment; we specialise in solving these problems for our clients. Unit lifted to full height with drum tipped at an angle. Using an existing chassis design, our team developed a long-reach head assembly. The head allows a variety of different drums, tubs and containers to be clamped securely. 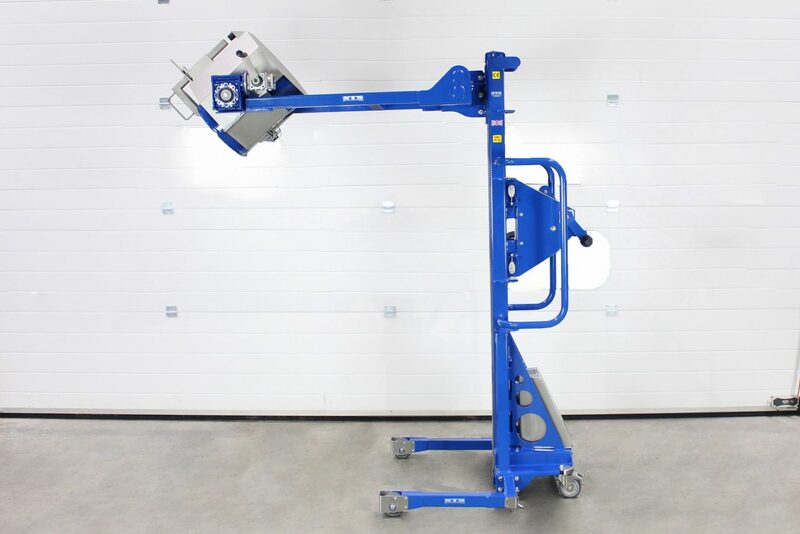 When the head is lifted you can rotate it using a self-locking rotational gearbox. Given the forward-protruding load, it was critical for the unit to be stable throughout its operation. We used a combination of rear-located counterweight and optimised leg lengths to ensure stability and safety. ATEX-certified for Zone 1 areas.